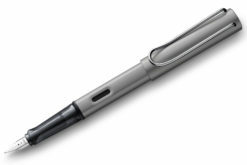 Lamy Vista Fountain Pen - Available online at Write GEAR. I just got the pen and inks, really loved the packaging and the real sweetener was the personalised letter from you guys – thank you very much and highly appreciated. For the price, I don’t think you can find a nicer demonstrator fountain pen – at least not in SA. As usual, very good Lamy build quality and I believe well worth the price as a casual/daily-carry fountain pen. Do take note though that the clear cap does pick up noticeable ink lines/smudges so regular wiping with a Q-tip is recommended (so that the ink doesn’t leave a permanent mark). This is probably the same with all other demonstrator fountain pens – it’s a little tedious but that’s what it is going to take if you want a demonstrator. You may also want to consider looking into using a Z26 converter as the metal part of the converter matches the chrome of the Vista’s cap. Hi Ryan – thanks for the heads, what is a Q-Tip? My very first fountain pen and it is all you can expect from the typical German product manufacturer. Looks great with superb quality to boot. Very happy – the transparent look is great – something different from the typical ‘classic’ pen – you can see everything that is going on. The plastic is strong and the nib is great. So far, very happy with no complaints. 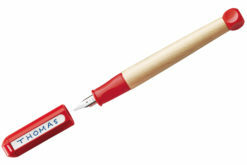 A superb pen for the price and love the fact that it is made in Germany. Lamy all the way! This pen is really well built and a pleasure to write with. Right now, mine’s wearing a B nib and filled with Diamine Teal. 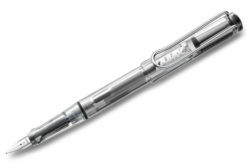 It’s a great every day writing pen. I have been writing with my Lamy Vista for just over a month and it has become my favorite fountain pen. It took some time in the beginning to get used to the grip, but proved to be very comfortable when writing for long periods. I use my pen daily for drafting letters and making notes, the 1.1mm Italic nib is easy to write with and produces neat variations in line width, something I have been looking for in a fountain pen for a long time. 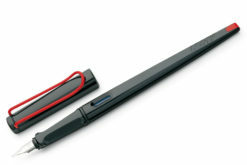 A colleague was so impressed with my Lamy fountain pen, he ordered one as well. Thanks to the guys at WriteGear for their excellent service, I am looking forward to my next purchase. I like this pen so much I have five of them – each one with a different nib and or ink colour. A pleasure to write or draw with, but I carry mine in a soft pen pouch which I ordered from Amazon so that they will be protected in my briefcase. Some people love the triangular section shape, and some hate it – I love it because it automatically ensures that you hold the pen correctly in relation to the paper. 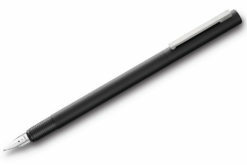 A nice light pen, ideal for hours of use and very comfortable either posted or unposted. I think the B nib is my favourite, because of the way it shows off my inks and the way it feels when moving across the page.